Travel was the order of the day, or rather, the next few days. We needed to make decent headway down the coast as there was a lot to pack in, and Australia was not going to get any smaller. After leaving Airlie Beach behind, we spent the next day travelling through Mackay and on to Rockhampton, but not without a much-awaited visit to a Mackay cinema to see The Avengers. I'm a huge Joss Whedon fan. Like most Joss Whedon fans I suspect, I don't think he's been given a particularly fair time in Hollywood. Most genre fans will be familiar with the Firefly cancellation debacle, his contribution to the film scripts of Alien Resurrection, Buffy and Titan A.E. wee altered significantly, and the promotion for his Firefly spin-off Serenity was noticeable in its absence. Respect appeared seriously lacking, but that will all change now. The Avengers is a masterpiece of comic-book film-making. Having taken four different Marvel franchises (Thor, The Incredible Hulk, Captain America and Iron Man)- all of which had successful films - he was tasked with somehow giving equal screentime to the main players, making the plot cohesive and, most importantly, making it an enjoyable experience. It's fair to say The Avengers succeeded on every level, and given that the film is now the third highest grossing movie ever made ($1.46 billion and counting), Mr. Whedon can finally rest easy that Hollywood is going to take notice. Incidentally, if you haven't seen the film yet, do so. 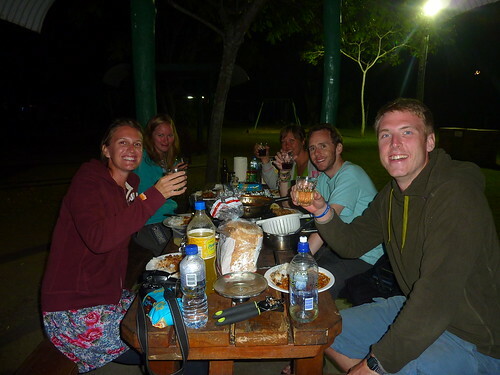 We met up with Colin and Julie from the Whitsundays trip in the evening, as they happened to pick the same free camping spot as us, so a huge bowl of spaghetti bolognese and much wine were in order. We headed along to the Capricorn Coast the next day, via Emu Park. 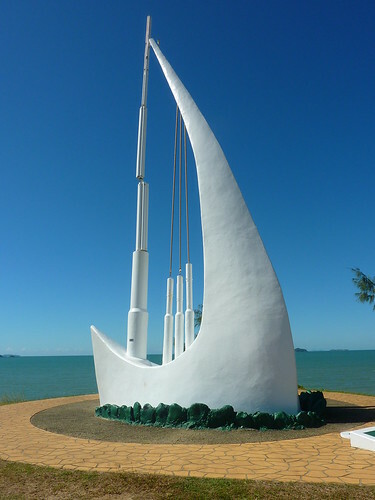 This town is best known for its Singing Ship monument, and little else. However, we tracked down the obligatory museum (well, not so much "tracked down" as "happened to park outside and decided to have a look), and were greeted by an enthusiastic retiree called Peter who proceeded to waive the fee to look around the place, gave us tea and biscuits, and demonstrated some of the tools used on the railway lines to lay tracks. 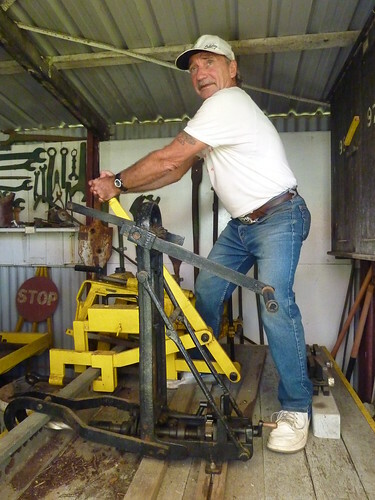 It seems like politics is alive and well in Emu Park, as Peter told us that a rival committee wanted to take over the running of the museum. I'm not quite sure why, there's not really that much to see; it looks like an octogenarian's storage room, full of bric-a-brac, faded photos and unidentifiable things in jars. I felt quite sorry for the guy; he'd been made redundant from a factory he'd worked at most of his life, and due to his age was deemed unhireable by most employers, so was living on Australia's benefits system and volunteering at the museum. It seemed like a pretty lonely job for a single old man. He had a huge passion for Triumph motorbikes and took the one he built himself out on the road from time to time. We left the museum behind and went up to the Singing Ship monument. This is named for the noise the wind makes as it passes through the monument's circular tubes, a clever feat of engineering. 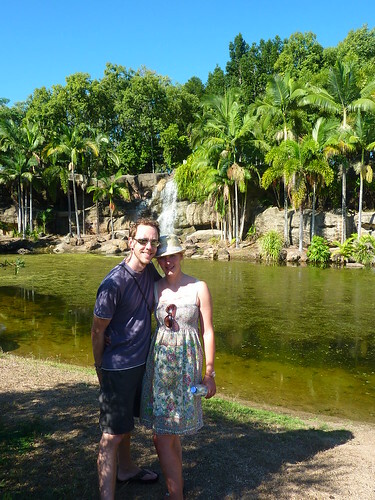 Leaving Emu Park, we had to stop off for lunch and where better than at Kershaw Gardens. I wasn't aware that I owned any gardens in Australia, perhaps I should have a word with my estate manager. I'm pleased with what my gardener has done, though. 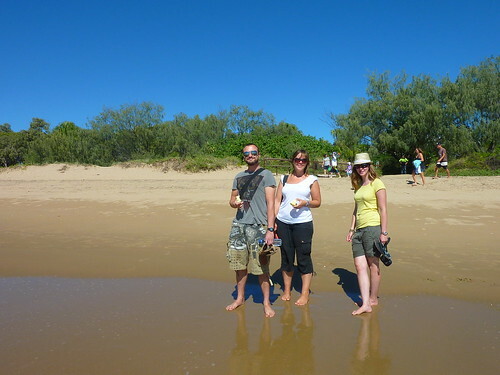 1770 and Agnes Water were the destinations the next day. 1770 is a town built on the site of the second landing of James Cook. Originally known as Round Hill, its name was changed in 1970 to mark the bicentennial anniversary of the landing. There really isn't much there aside from a few plaques and a nice view. 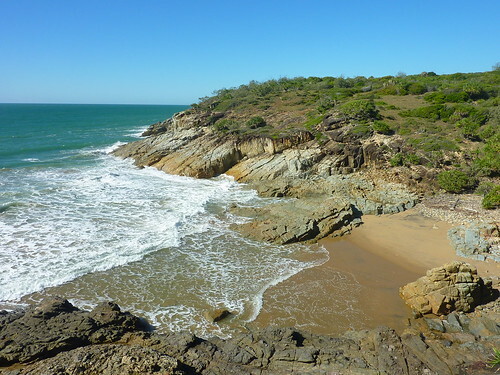 Agnes Water has even less to offer, other than a passable beach which obviously paled in comparison to Whitehaven which was still fresh in our minds. 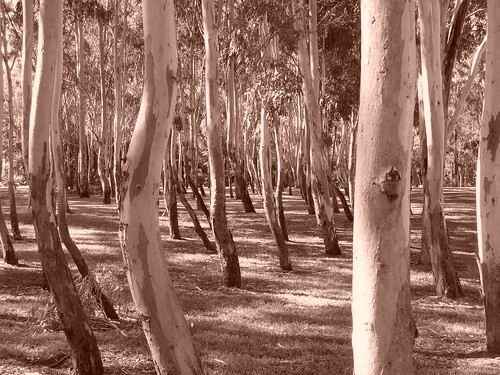 Needless to say, we zipped through both places as time was pressing and drove on to Bundaberg. 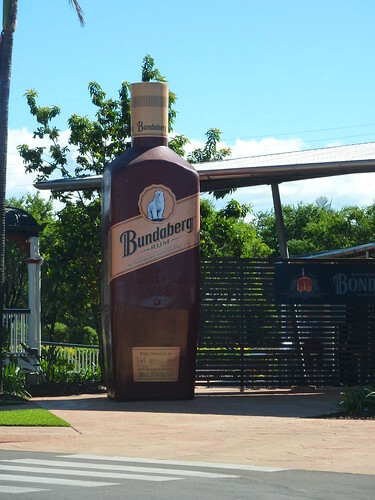 Home to the famed Bundaberg rum factory, we considered taking a tour...until we saw the price. None of us were that keen on rum. 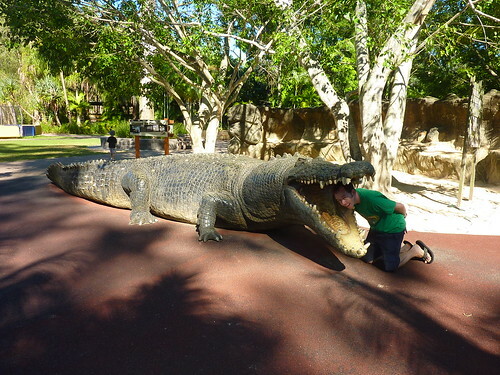 Another night in a caravan park, and we were at the Steve Irwin Zoo (or Australia Zoo as it is officially known) early the next morning. 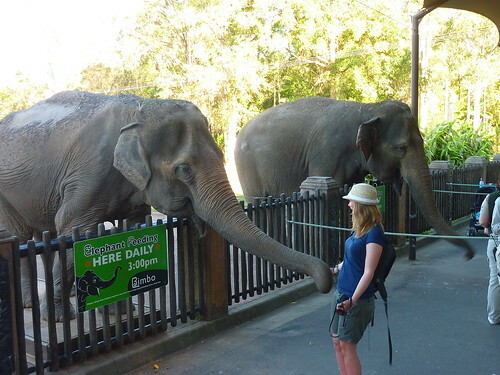 I think we were spoiled by the Billabong Sanctuary, as our visit to the zoo was a day of disappointment and frustration. Aside from ticket costs being three times the price of our earlier brush with wildlife, we'd heard nothing but good things from people about the late zookeeper's former business. 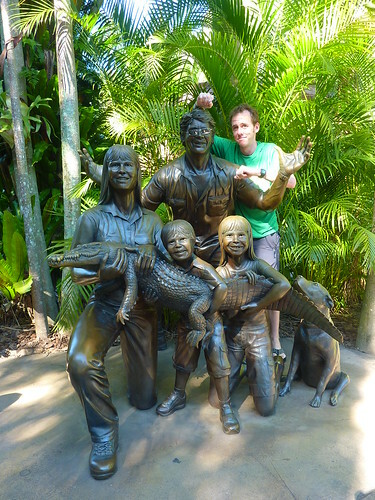 We were greeted on entry by a family bronze; it looked like Steve would have preferred wearing sunglasses so I obliged. 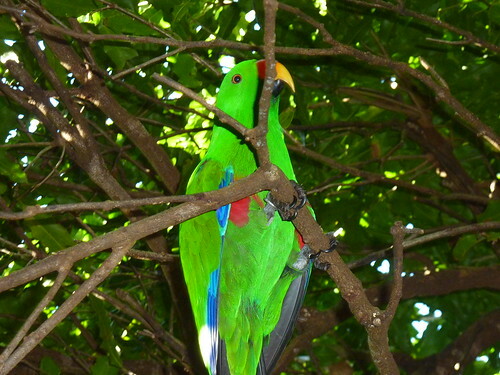 The zoo is split into various continents, complete with their respective inhabitants. 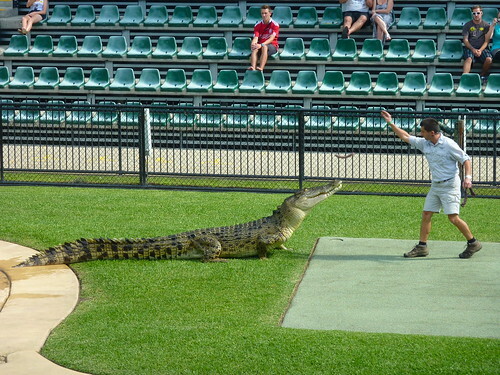 There are a number of shows throughout the day including a croc show, snake talk, bird show, tiger show, elephant feeding, and so on. 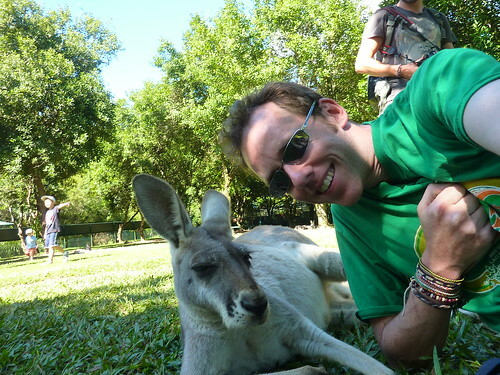 There are also areas where you can stroll through and interact with the animals, such as two large kangaroo parks containing red and grey kangaroos. The animals seemed pretty healthy and well-cared for, which was good to see. 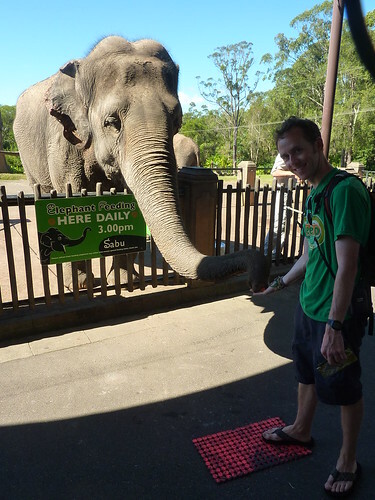 The zoo has been in the hands of Irwins for years, and after inheriting it from his parents Steve, his wife and his brood turned it into a "larger than life" attraction, complete with cheesy shows, in-yer-face signage, and information boards bordering dangerously close to patronising. This I can handle. 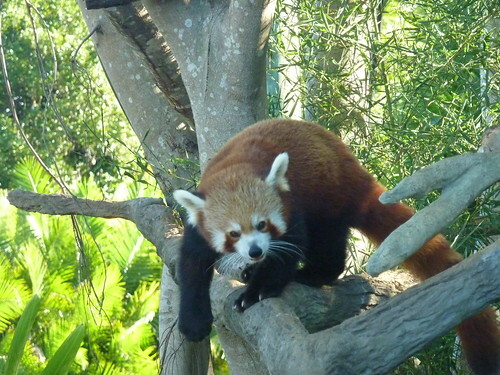 Zoos are meant to be child-friendly, and this one was no exception. 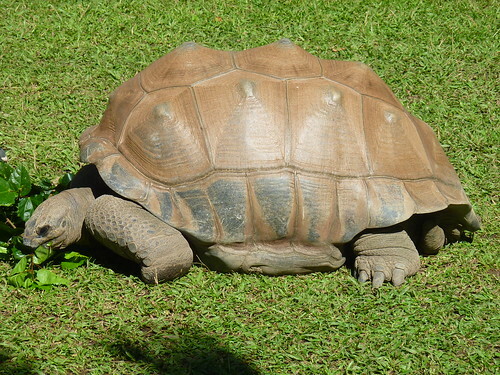 However, there are certain things that the zoo categorically failed at doing. 1.) If you're going to put on a shuttle service between areas, put up a timetable. We spent the best part of an hour waiting around for various trains throughout the day. It wouldn't have been a problem if we could walk everywhere, but the "Africa" section of the zoo was only accessible by train. 2.) Following on from the first point, if you need to close areas of the zoo, at least make it clear. We were told you couldn't walk to "Africa" but at the end of the day the path was opened up. It made no sense - no work was going on that we could see, but routes around the zoo were arbitrarily opened and closed at various intervals, without warning. 3.) Provide up to date maps. The ones we were given had incorrect show times, out-of-date information about the areas to visit, and was pretty much useless. Upon asking at the gate on the way out of the zoo, we were told that "all of the old maps had to be given out, as we have a backlog to get rid of." So the best thing to do in order to enhance the experience of the visitor is provide them with something that has no relevance to the place they are visiting? Brilliant. 4.) Hire more park staff. If you're going to give people duff maps, at least make people available to ask for directions once you end up in a completely different place than expected. I've never been to a zoo that had so few workers on hand, and the size of the park is not inconsiderable. 5.) Stop the irritating self-promotion. Unlike its unfortunate father, Brand Irwin is alive and well in the zoo and is thrust at you from all angles to the point of creepiness. Irwin's son squeaks out various zoo-related songs over the tannoy on an endless loop which I can only assume can also be heard by unfortunate souls occupying the many Circles of Hell (the CD is available to buy in the shop, natch). His daughter, Bindi, is plastered everywhere from signage, to videos shown during the shows, to - most disturbingly - dolls which can be found in the gift shop. That's right, you can buy a Bindi doll (or several if you desire) complete with accessories, modeled on a hyperactive teen whose only claim to fame is being the daughter of two crazy parents. The shameless self-publicity would make even Katie Price blush. So, after a half day's travel we arrived in Brisbane. It's a much-maligned city compared to its more cosmopolitan "neighbours" of Sydney and Melbourne, but it is supposedly the hub of Australia's music scene and a decent place in its own right. 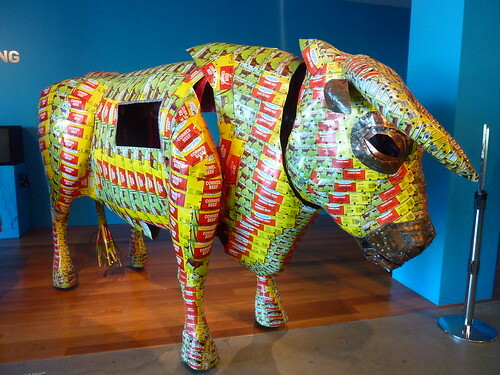 We didn't really find out if that was the case; after trying to negotiate the horrendous one-way system in the city and becoming more and more frustrated at the lack of available and reasonably-priced parking, we ended up parking in the arts centre and having a look around GOMA (the Gallery of Modern Art). 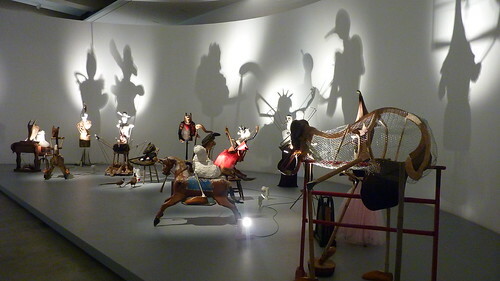 In fairness, it was excellent and had a large and diverse range of exhibits, some pretentious, some straightforward, most of them interesting. 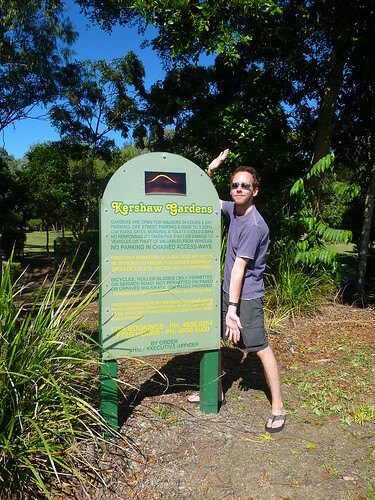 That aside, we decided not to stay around in Brisbane much longer and carried on down the coast to the next holiday park. Weekends are perhaps not the best time to visit any city so I can't be too harsh on the place, and it's certainly somewhere I'd come to again if we visited Australia sans campervan, if only to see which bands were playing.